Carefully designed to provide good traction whilst you’re performing yoga exercises. 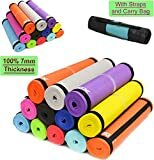 Xn8 Sports Yoga Mat is 6mm thick and provides excellent comfort and shock absorption; thus protecting your knees and feet and making it suitable for a number of different fitness activities not only Yoga. This is a perfect companion for use with training exercises at home or in the gym. Featuring a light weight design with easy to carry handles; so you can now to take this to your Yoga, Pilates or any other fitness classes. To help protect the environment this product is packed in biodegradable shrinkable plastic. Our effort to avoid paper box is to help protect the environment. Yoga Mat - Extra Thick 15mm, Non-Slip With Shoulder Carry Strap For Easy Transport available in Black / Blue / Purple. Original Lifting Grips – by GRIP POWER PADS® The Alternative To Gym Workout Gloves Comfortable & Light Weight Grip Pad For Men & Women That Want To Eliminate Sweaty Hands While Exercising, Extra Thick Padding – Maintain Perfect Grip.